At Ss Peter & Paul Catholic Primary School we always work to provide a stimulating and interesting environment where children have the opportunity to develop their talents to their full potential. We strive to nourish each child’s faith by widening it within the life and work of the school, in partnership with parents and the Parish community. This is done in accordance with the teachings of the Catholic Church. We ensure that children know how to follow the example and teachings of Jesus. We encourage children to ask questions about the teachings of Christ and to develop enquiring minds. We are aware that a child’s needs and levels of understanding in RE change and develop. We adapt to these needs through the following aims which are underpinned by our school’s mission statement. We promote concern, consideration and respect for all others regardless of race, culture, gender or disability. This is further strengthened by our links with charities such as Father Hudson’s and our Lenten Charity work. We create a happy, purposeful and caring environment which fosters the intellectual, emotional, physical and spiritual development of each child. We continue to fully develop the talents of each child through a balanced RE curriculum and by providing work suited to individual needs. 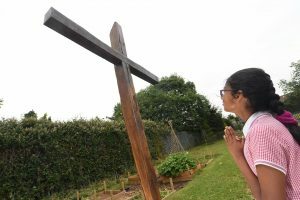 The children at Ss Peter & Paul Catholic Primary School are given the opportunity to learn about different Religions and Faiths. We have Multi-Faith themed assemblies and the children work very hard to produce beautiful and informative display work. We also recognise not only the importance of allowing children to flourish and embrace our wider role in preparing them for their adult life beyond the formal examined curriculum. Part of our role in preparation is ensuring that we promote and reinforce British Values to our pupils. Every child and members of staff will be given one of these four Houses to support. Siblings are placed in the same houses. Teaching and non-teaching staff will also belong to a House, with the exception of the Senior Leadership Team, as they will encourage and support the children in positive team building through the House system. 1 house point for an isolated achievement (e.g. a one off act of kindness, helpfulness, good work etc). 2 house points for a sustained achievement (e.g. sustained good behaviour, an achieved target, hard work on a project etc). 3 house points for a special achievement (e.g. something that goes above and beyond) or a group achievement (e.g. for winning a class based team game). 5 to 10 house points can be awarded for extra special achievements by the Senior Leadership Team including ‘WOW’ work and ‘Stars of the Week’. This system aims to encourage a real sense of pride and achievement for the children. It fosters community spirit and gives the children an opportunity to contribute to something bigger, which involves children from all year groups. The older children are positive role models and take on a pastoral role for the younger children. 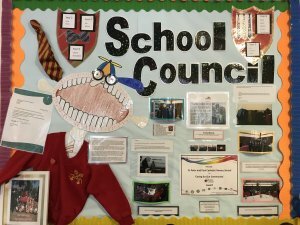 We value the opinions of our pupils and the School Council gives pupils a forum to share these opinions with the Principal. It provides our children with the opportunity to raise issues, share ideas and participate in discussions and decisions made about the school which may affect them. Elections to become a member are held annually and consist of children from each year group who are then voted in by their fellow students. The School Council members within the Romero Academy gather regularly as part of Pupil Voice to share ideas on how they can help to assist the local community. Currently they are working on the “Good Citizenship” – Serve, Inspire, Inclusion, Nurture, Truth & Succeed, which underlines their values of helping those in need. Last year was a busy year for them, on the fund raising side of things they hosted non-uniform days, school discos, film nights, cake sales and toast Tuesdays to name but a few. They held an afternoon tea with the Lord Mayor, helped with the memorial garden and with the schools 50th anniversary celebrations, the pupils social and interaction skills, team working and creative thinking are really developed to its full potential. Going forward the priorities for 2018/2019 are to continue to build positive home & school links, improve barriers to learning through pastoral and mentee programmes, raise the profile of attendance/punctuality through the school and continue to ensure that safeguarding procedures are being maintained and that pupil voices are being heard. We started this academic year with “Pupil Voice Training” along with all the schools within The Romero Catholic Academy. This involved group tasks encouraging students to work as a team, listen to others and work across the Academy with other School Council representatives. 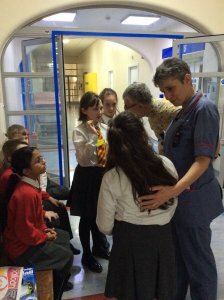 The School Council fundraising efforts this year are in aid of The Chaplaincy Team of Birmingham Children’s Hospital. They provide spiritual, religious and pastoral support for all patients and families in the hospital. The service is open to people of all faiths and none. The multi-faith team provides a 24/7 on-call cover so that there is always help in an urgent situation. We will be coming up with innovative ideas to help this very worthwhile cause. To date we have raised £300.00, overall the Romero Academy has raised just under £3000.00. If you would like to donate please contact Ms Gordon via the School Office. In addition to the above we are working with the Coventry Youth Council on the subject of knife crime. 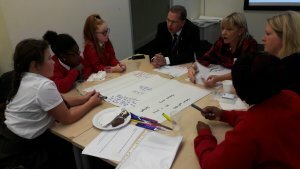 The School Council members attended a partnership meeting arranged by Coventry City Council called “11 Million Day” with other schools from Coventry. 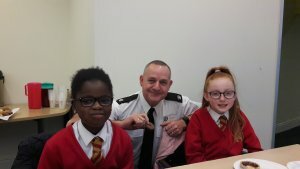 We were able to meet many influential professionals, which included people such as The Director of Children’s Services for Coventry City Council, John Gregg, a member of the police force and a lecturer from Coventry University to name but a few. Discussions were held around safety in Coventry for young people, anxiety and Coventry becoming the City of Culture. Give our children a more active and personal faith in Jesus Christ. Build an inclusive community which welcomes diversity, encouraging respect and tolerance towards others. Develop and foster a loving and caring relationship with our school and wider community. Through the teaching of the gospel, children are encouraged to live their life with integrity. We provide opportunities to reflect and celebrate the talents and gifts of all our children as they continue on their journey as lifelong learners.